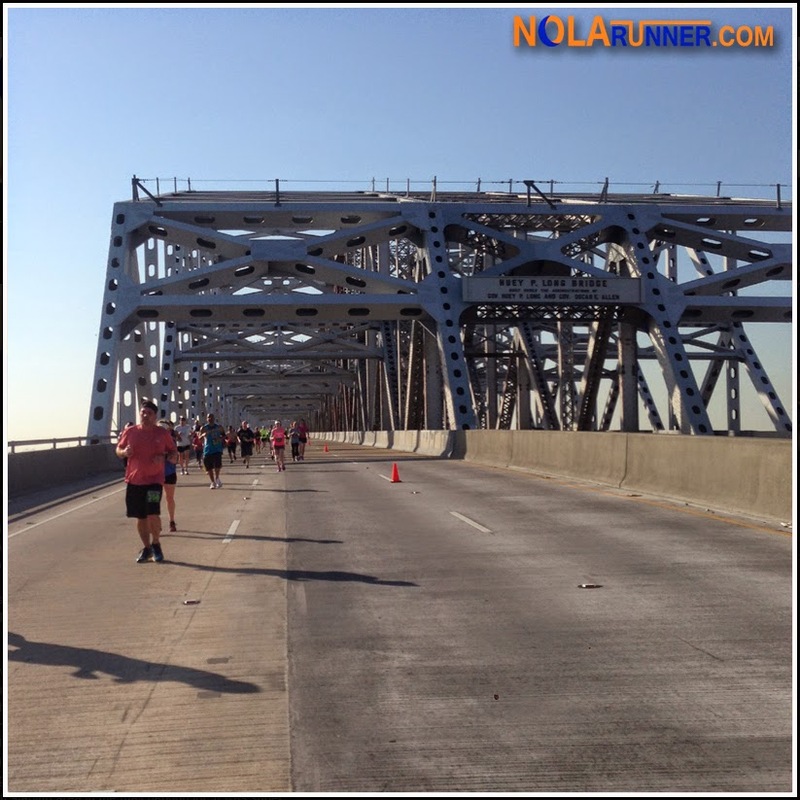 Friday night was the annual Zoo-To-Do event at the Audubon Zoo, and an evening full of restaurant tastings and open bars could have prevented me from waking up early Saturday morning to participate in the Huey P. Long Bridge Run. However, knowing my limitations allowed me to participate in both of these great events! The 2014 pre-race packet pickup happened on Friday, the day before the race. This gave runners a preview of the location for the post-race party, which had moved under the bridge on the east bank side of the river. I was thrilled, as the only issue I had with the inaugural race was now corrected. Getting the party off the hot asphalt of a Wal-Mart Parking lot was the right move, and would make the event that much more enjoyable. Race morning took me back to high school, as I boarded a big yellow bus near the finish to get shuttled to the start. I timed my arrival perfectly, as my wait for transportation was short and the starting gun fired soon after I had taken my place amongst the runners who were ready to #GeauxOverIt. Unlike last year, the race shifted sides of the bridge, with runners heading in the same direction traffic normally would. The first mile of this course has runners traversing a flat approach to the bridge, and while the streets were closed, a train could be seen on the tracks that run parallel to the overpass. It made me nervous that we would feel the shaking and swaying of the bridge that the steam engine causes. Fortunately, as we reached the incline, the train had finished crossing and it was a smooth crossing of the spans. I think the elevation of the Huey P. Long Bridge is the most manageable of the three local bridge races, and the downhill the easiest to maneuver. Water stations at both mile markers on the course were perfect, and the change in course for the 2014 event moved the finish line to the base of the bridge. It was great not having to make several hard left turns after finishing the bridge's descent, and having the finish flow directly in to the post race party. After retrieving my finisher's pint glass, I headed to check out the food. NOLA post-race staple Blue Runner Red Beans were on hand, as well as a whole wheat pasta salad. My stomach was still queasy from the mash up of food I had the night before at Zoo-To-Do, so I opted for a lot of water and sports drink before heading home. I can say that Abita Beer was flowing while a live band played, and participants were happy to have their pint glasses on hand to fill up. I'm sure the party lasted through the afternoon. The only concern I had from the race this year occurred prior to race day. While the spot under the bridge was perfect for the post-race party, it was not ideal to accommodate the pre-race packet pickup. Parking in the area was tricky, and crossing Clearview Parkway at the base of the bridge unsafe. Race organizers have already responded to posts on their Facebook Page regarding the matter, and have plans in place to move pre-race packet pickup to multiple locations next year. 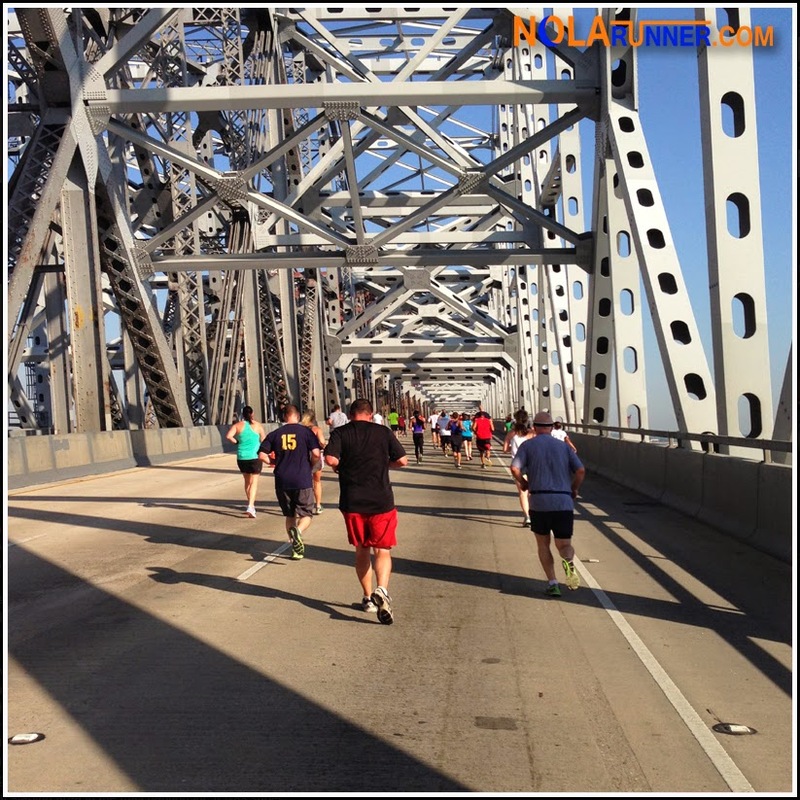 Each race in the Louisiana Bridge Run Series has earned its place on the racing calendar, putting on quality events year after year. 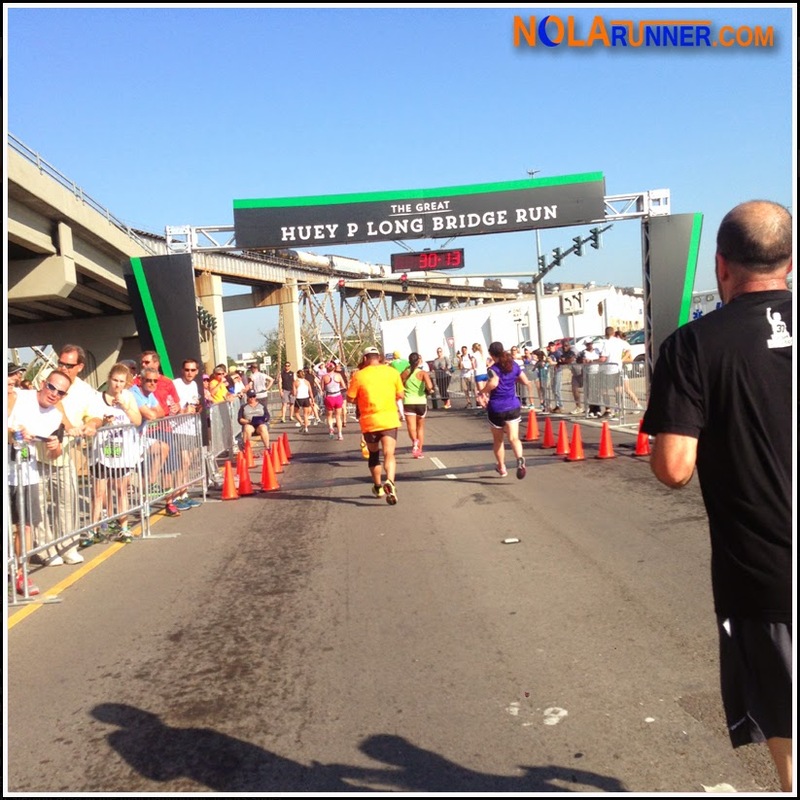 Even in the second year of existence, the Huey P. Long Bridge Run feels like a tradition that I can't picture myself missing. For more pictures taken during the race, LIKE the NOLArunner Facebook page HERE.